The Prime Minister of Canada ( ) is the primary Minister of the Crown, chairman of the Cabinet, and thus head of government of Canada . The office is not outlined in any of the documents that constitute the written portion of the constitution of Canada; executive authority is formally vested in the Canadian sovereign and exercised on his or her behalf by the Governor General. The office was initially modelled after the job as it existed in Britain at time of Confederation in 1867. The British prime ministership, although fully developed by 1867, was not formally integrated into the British constitution until 1905—hence, its absence from Constitution Act, 1867. The prime minister is not elected directly, but is by constitutional convention the leader of the political party that holds the largest number of seats in the House of Commons. According to protocol, all prime ministers are styled The Right Honourable (in French: Le Très Honorable) for life. The current prime minister is Stephen Harper, appointed by Governor General Michaëlle Jean as the 22nd Prime Minister of Canada on February 6, 2006, after his party earned the most seats in the general election. He is the leader of the Conservative Party of Canada. The prime minister, along with the other ministers of the Cabinet, are formally appointed by the governor general on behalf of the Queen. However, by convention designed to maintain stability in government, the governor general will almost always call on the leader of the party that holds the most seats in the House of Commons to form a government. Legally, any citizen of Canada of voting age (18 years) can undoubtedly be appointed to the office of prime minister, these being the requirements to gain election to the House of Commons. Since it is not legally necessary for the prime minister to be a sitting Member of Parliament (MP), there is some question as to whether there are technically even age or citizenship restrictions to the position. In any event, it is customary for the prime minister to also be a sitting member of the House of Commons, although two prime ministers have governed from the Senate: Sir John Joseph Caldwell Abbott and Sir Mackenzie Bowell. 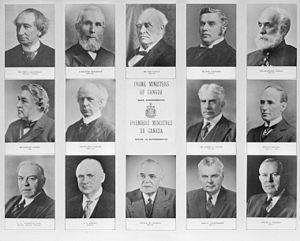 (Both men, in their roles as Government Leader in the Senate, succeeded prime ministers who died in office in the 1890s; Canadian convention has since evolved toward the appointment of an interim leader in such a scenario.) One prime minister, William Lyon Mackenzie King, having lost his own seat in a general election while his party retained a plurality in the House of Commons, briefly governed "from the hallway," until he won a by-election a few weeks later. John Turner, who was previously an MP but had quit politics, was Canada's only non-MP prime minister. He ran for Liberal Party leadership to replace Pierre Trudeau. Turner won a seat at the next election but his party didn't hold the most seats. If the prime minister should fail to win his or her seat, a junior member of parliament in a safe seat would typically resign to permit a by-election to elect that leader to a seat. However, if the leader of the governing party is changed shortly before an election is due and the new leader is not a Member of Parliament, he or she will normally await the general election before running for a seat. For example, John Turner was briefly prime minister in 1984 without being a member of the House of Commons; he won his seat in the general election that swept his party from power. The official residence of the prime minister is 24 Sussex Drive in Ottawa , Ontario . All prime ministers (with the exception of Kim Campbell) have lived there since Louis St. Laurent in 1951. The prime minister also has a secondary residence at Harrington Lake in Gatineau Park near Ottawa . In earlier years, it was tradition for the sovereign to bestow a knighthood on each new Canadian prime minister. As such, several carry the prefix "Sir" before their name (of the first eight prime ministers, only Alexander Mackenzie refused knighthood). After the Nickle Resolution debate of 1919, it was against policy for the Sovereign to grant titles to Canadians; the last prime minister knighted was Sir Robert Laird Borden, who was in power when the Nickle Resolution was debated. (Being only a Commons resolution, it has never been binding.) In addition one prime minister, Richard Bennett, was created a viscount after his retirement and the widow of Sir John A. Macdonald was created a baroness. A prime minister does not have a fixed term of office - once appointed and sworn in (s)he retains the office until (s)he resigns, is dismissed or dies. The Constitution of Canada limits the lifespan of each Parliament to five years after which a general election for every seat in the House of Commons must be called; the time limit may be exceeded only in case of war or insurrection. The prime minister has typically asked the governor general to issue a writ of election during the government's fourth year in office. If the sitting prime minister's party wins a general election there is need to re-appoint the prime minister or swear him or her in again (although after almost any such election the prime minister will be advising the governor general regarding any changes to the Cabinet that may be necessary, for example to replace ministers who have lost their seats). Amendments to the Canada Elections Act passed in 2007 during the first session of the 39th Parliament have brought about legal changes that are designed to constrain when the prime minister can request a dissolution of Parliament. Under the revised act, a general election must occur on the third Monday in October every four years starting in 2009. Other than cases of war or insurrection, the only exceptions provided for under the Act are when the government is defeated by a vote of no confidence (discussed below) or otherwise "prevented from governing." The Canada Elections Act is not a part of the constitution and can be further amended or repealed by Parliament. Otherwise, by constitutional convention, the governor general cannot refuse a request to issue the writs of election, issue writs in the absence of a request, or dismiss the prime minister and his government without having been offered their resignations unless acting contrary to the prime minister's wishes is necessary to avoid contravention of either the Constitution or (possibly) an Act of Parliament (including as the aforementioned Canada Elections Act). The only time since Confederation time it was deemed necessary to refuse the prime minister's request to call an election was 1926 (see the King-Byng Affair). A Canadian vice-regal's presumed right and obligation to refuse to grant a dissolution where the dissolution would only violate an Act of Parliament has not yet been tested either at the federal level or in those provinces that have enacted similar "fixed election date" legislation. The only other situation where an extraordinary use of the governor general's powers might be acceptable would be if the prime minister was no longer able to offer competent advice to the governor general - for example, if (s)he became incapacitated. There are no formal provisions regarding what is to be done if a Canadian prime minister becomes incapacitated and unable to serve for an extended period of time (this has never happened). Presumably, if such incapacitation appeared to be long term or permanent and the prime minister could not sign a letter of resignation the governor general would use his/her reserve powers to remove him/her and appoint the governing party's choice for a replacement. In general, a majority government is in power three to five years before a new general election is called. A minority government typically calls a new general election at the first opportunity when it appears able to win a majority of seats. Otherwise, it is unusual for minority governments to last more than two years owing to their vulnerability to votes of non-confidence. For example, in 1979–1980, Joe Clark was prime minister in a minority Progressive Conservative government only six months before his government lost a motion of non-confidence and had to call another election. The new Liberal majority government took office in 1980 just nine months after the Clark government had taken office in 1979. A prime minister is required to resign only when an opposition party wins a majority of seats in the House. If the prime minister's party wins a plurality, he or she normally stays in office. (A prime minister may resign in this circumstance, but there is no requirement to do so.) If the prime minister's party wins a minority while an opposition party wins a plurality (i.e., more seats than any other party but less than a majority), the prime minister can attempt to remain in office by forming a coalition with other minority parties. This, however, is almost never attempted in Canada. If a governing party loses a motion of non-confidence, the prime minister—and, thus, the government—may resign, thereby allowing another party to form the government. But as this is practical only if no party in the House has a majority, the convention in Canada is to immediately ask the governor general to call a general election. If a general election gives an opposition party a plurality of seats, the incumbent prime minister can continue to try to form the government, but this has not been done at the federal level since 1925, although it remains an option under the constitution. The normal practice in this situation is for the prime minister to resign and for the governor general to appoint as prime minister the leader of the new largest party in the House of Commons. Since the prime minister is, in practice, the most powerful member of the Canadian government, he or she is sometimes erroneously referred to as Canada's head of state. The Canadian head of state is Elizabeth II, Queen of Canada, who is represented by the Governor General of Canada. The prime minister is the head of government. The office of Prime Minister of Canada is not mentioned in the Canadian Constitution. In modern-day Canada, however, his or her prerogatives are largely the duties to which the constitution refers to as the job of the governor general (who acts mostly as a figurehead). The function, duties, responsibilities, and powers of the prime minister of Canada were established at Confederation, modeled upon the existing office of the Prime Minister of the United Kingdom. Over time, the role of the Prime Minister of Canada has evolved, mainly gaining power over the years. The prime minister plays a prominent role in most legislation passed by the Canadian Parliament. The majority of Canadian legislation originates in the Cabinet of Canada, which is a body selected by the prime minister, and appointed by the governor general, largely from the ranks of his party's MPs. The Cabinet must have "unanimous" consent on all decisions they make, but in practice whether or not unanimity has been achieved is decided by the prime minister. plus approximately 3,100 other government positions, the bulk of which the Prime Minister usually designates a member of his staff to appoint with his concurrence. As to the prime minister's broad de facto authority over the Canadian military, see Canadian Forces. Former Prime Minister Pierre Trudeau is credited with consolidating power in the Office of the Prime Minister (PMO), although the evolution can be seen throughout Canadian history. The PMO consists of the prime minister's political and administrative staff hired solely at the PM's discretion. By coordinating communication with the other agents in policy arenas, as well as with the central party apparatus, the PMO can wield considerable influence. This may have the positive effect of a productive parliament, which in turn provides a valid criticism of centralized power in majority governments and the PMO. There are checks on the prime minister's power. Cabinet or caucus revolts will bring down a sitting prime minister quickly, and even the threat of caucus revolts can persuade and/or compel a prime minister to resign the office as happened to Jean Chrétien in 2003. The prime minister is also restricted by the Senate. The Senate can delay and impede legislation, which occurred when Brian Mulroney introduced the Goods and Services Tax (GST). In many cases, the conflicts arose primarily because the Senate was dominated by members appointed by previous governments. The aforementioned prime ministers proceeded to shift the Senate in their favour with a flurry of senate appointments to ensure the smooth passage of legislation. Furthermore, as Canada is a federal system, the action of the federal government (and thus the prime minister) is limited to areas of federal jurisdiction. In practice, however, provincial and federal actions are intertwined in most areas, and so the prime minister's power can also be thwarted by concerted opposition from provincial governments. As well, as executive power is formally vested in the Canadian monarch and "exercised" by the governor general as the vice-regal, either body has the power to oppose a Prime Minister's will. Senator and constitutional expert Eugene Forsey stated that a "governor general must take all steps necessary to thwart the will of a ruthless prime minister." This power of the governor general was last used by Lord Byng against Prime Minister William Lyon Mackenzie King in what is known as the King-Byng Affair of 1926. Some, such as the Canadian Broadcasting Corporation's Larry Zolf, also speculated whether the then Governor General Adrienne Clarkson would refuse a recommendation from Prime Minister Jean Chrétien to dissolve Parliament in 2002. Near the end of her time as Governor General, Clarkson stated: "My constitutional role has lain in what are called 'reserve powers:' making sure that there is a prime minister and a government in place, and exercising the right 'to encourage, to advise, and to warn' [...] Without really revealing any secrets, I can tell you that I have done all three." According to the Ottawa Citizen, in 2008 the Prime Minister of Canada had an aggregate annual salary of $301,600 (CAD). Although this sum is several times the national average, it is only a fraction of the pay of some of Canada's top corporate executives. Only about half of the Prime Minister's salary is specific to the role of the prime minister, while the other half is the normal salary of a Member of Parliament. The Prime Minister's privileges include the official residence, 24 Sussex Drive , a country retreat, Harrington Lake and a armoured long-wheelbase Cadillac STS. He/She is also eligible to use the Governor General's stretch limousine at various times. The official residence comes with a number of staff including chefs, maids, butlers/ushers, gardeners and security forces. The Prime Minister also has the privilege of using two official aircrafts, The CC-150 Polaris for international flights and the Challenger 601 for domestic flights. Cabinet has now joined Parliament as an institution being bypassed. Real political debate and decision-making are increasingly elsewhere—in federal-provincial meetings of first ministers, on Team Canada flights, where first ministers can hold informal meetings, in the Prime Minister's Office, in the Privy Council Office, in the Department of Finance, and in international organizations and international summits. There is no indication that the one person who holds all the cards, the prime minister, and the central agencies which enable him to bring effective political authority to the centre, are about to change things. The Canadian prime minister has little in the way of institutional check, at least inside government, to inhibit his ability to have his way. The main case given in favour of prime ministerial power has to do with the federal structure of the nation. Canada is one of the most decentralized of the world's federations, and provincial premiers have a great deal of power. Constitutional changes must be approved by the provincial premiers, and they must be consulted for any new initiatives in their areas of responsibility, which include many important sectors such as health care and education. In light of regional forces such as the Quebec sovereignty movement, some have argued there is a need for a national counterbalance to these pressures. Sir John Sparrow David Thompson died of a heart attack at Windsor Castle (1894). Thompson, Tupper and Bennett are the only Prime Ministers to have died outside of Canada (all in England ). Unlike most state leaders, who are buried in the nation's capital, Canadian prime ministers are buried in locations of their or their family's choice. Bennett is the only Canadian prime minister to have been buried outside of Canada. Diefenbaker is the only one not to be buried in a cemetery. Most burials are private functions at the request of the families. Canadian prime ministers are buried in Quebec, Ontario, Nova Scotia and Saskatchewan. Only one is buried in the United Kingdom. A state funeral for a deceased prime minister, with the casket lying in state in Centre Block on Parliament Hill, is offered to their family. Only Bowell and Bennett had private services. Bennett was the only prime minister to die and be buried outside of Canada. Bowell is the only prime minister not to have politicians attend his funeral. Fictional Prime Ministers of Canada have been portrayed in television series, including Rideau Hall, South Park and The West Wing, televisions films such as H2O, and the motion pictures Canadian Bacon and Buried on Sunday. Jean-Jacques Charles: A Very Political Lady (1979) by Judy LaMarsh, said to be based on Pierre Elliott Trudeau. Sir Henry Marwood: Pour la patrie (1895) by Jean-Paul Tardival, said to be based on Sir John A. Macdonald. Barton McGarvie: Scribes and Scoundrels (1997) by George Galt, said to be based on Brian Mulroney. Huntley McQueen: Two Solitudes (1945) by Hugh MacLennan, said to be based on William Lyon Mackenzie King. April McTavish: Party Favours (1997) by Jean Doe, said to be based on Kim Campbell. The Prime Minister: S: Portrait of a Spy (1977) by Ian Adams, said to be based on Pierre Elliott Trudeau. Jean Rioux: Party Favours (1997) by Jean Doe, said to be based on Paul Martin. Carter Warden: A Very Political Lady (1979) by Judy LaMarsh, said to be based on John Turner. Paul Martin in the third-season episode "Fun Run"
Stephen Harper in the fourth season episode "Gopher It"
Several sitting prime ministers have also appeared as themselves on the CBC sketch comedy series Royal Canadian Air Farce, while Harper appeared in an installment of the satirical CBC series The Rick Mercer Report. Brian Mulroney was portrayed in the "Robin Sparkles" video on season two of How I Met Your Mother. Stephen Brooks, Canadian Democracy: An Introduction, 5th ed. (Don Mills, Ontario: Oxford University Press, 2007), 233-234. Donald Savoie, Governing from the Centre: The Concentration of Power in Canadian Politics (Toronto: University of Toronto Press, 1999), 260. Jeffrey Simpson, The Friendly Dictatorship (Toronto: McClelland & Stewart, 2001), 248. Brian Busby. Character Parts: Who's Really Who in CanLit. Toronto: Knopf Canada, 2003.